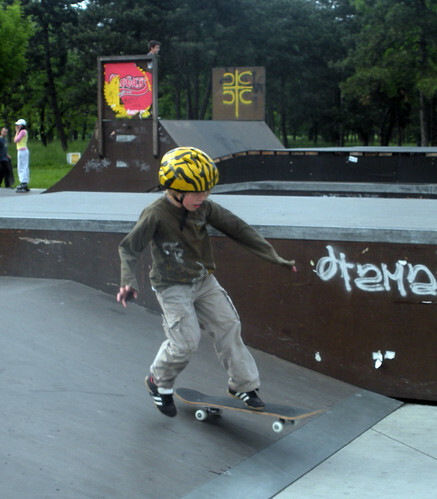 New Belgrade Skate Park, originally uploaded by bill kralovec. We are entering a new stage in the life of the boys. 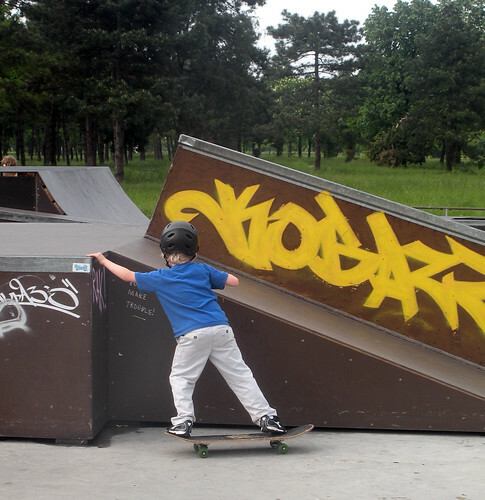 Owen has become interested in skateboarding. He goes out just about every night to skateboard down our street. He is shown above at the New Belgrade Skate Park. I took the boys over there during the Spring Break holiday. We had a wonderful afternoon of biking through Friendship Park and then boarding at the skate park. If you go to my flickr account, you can see videos of the boys in action. Oliver is shown below. He always tries to keep up with his older brother. Ollie is getting quite good with the bicycle. He is almost ready to ride to school with us. A couple of more weeks of practice and he’ll be on his way. Ollie is not yet ready for the skateboard as you can see. Ocean is also getting into the act with her tricycle and no-pedal bike. She always asks me to carry her bike back up the hill on the street near our apartment. She then races next to me up the hill. The only issue with our street is dodging the secret service vehicles leaving from the back entrance of the Serbian President’s residence. They come out of there like there is an emergency of national concern every time. Weather has taken a turn for the cool side. It felt like winter yesterday.